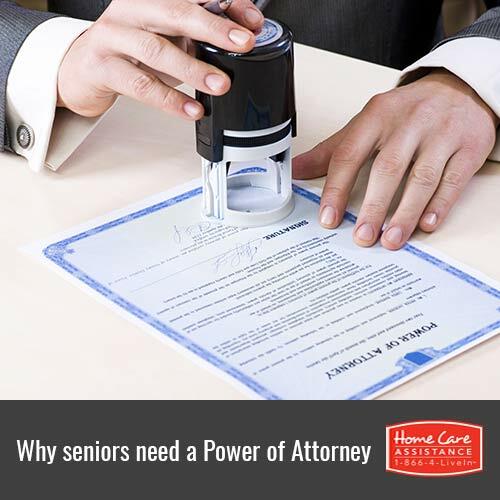 Assigning durable power of attorney is one of the most important parts of a senior’s long-term planning process. Unfortunately, this is a step many aging adults and their families overlook. Before cognitive functioning and other abilities start to decrease, all seniors should work with an elder care lawyer to ensure this document is in place. Following are a few benefits your elderly loved one can gain by doing so. Without power of attorney in place, your loved one has no power to determine who will make important financial decisions once he or she is no longer able to do so. This will instead become the responsibility of the court. When this happens, conservatorship or guardianship will likely be established, both of which can be very expensive. The process of establishing power of attorney gives families the opportunity to discuss end-of-life wishes with their aging loved ones. While these conversations are rarely easy, they are still extremely important. Your loved one will also have the ability to officially determine who will act as his or her agent in these arrangements and can seek the approval and commitment of family members before assigning a specific agent. Families often argue about what a person’s wishes or intentions are after the individual becomes too incapacitated to express them verbally. Power of attorney gives your loved one the ability to clarify his or her intent so no contentions or concerns arise in the future. Once documented and signed, power of attorney will offer clear evidence of what your loved one wants as well as his or her wishes related to Harrisburg at-home care. When choosing an agent to act on his or her behalf, your loved one must assign power of attorney to legally empower this agent. When family caregivers in Harrisburg have to work with medical doctors, insurance companies, and other entities, they can use this document to assert their legal authority to make important decisions. Unless your loved one’s wishes are put in writing, they cannot be honored in most instances irrespective of how assertive the related agent may be. End-of-life planning is difficult to face, but it can prove to be more than worth the effort. Once your loved one has formalized long-term plans he or she can enjoy far greater peace of mind. With trusted agents who are duly empowered in place, your loved one can rest assured his or her needs will always be met. Once you understand your loved one’s needs and wishes, you’ll want to secure the right senior care agency to provide him or her with high-quality care. If your loved one needs a part-time or live-in caregiver in Harrisburg, reach out to Home Care Assistance. Our caregivers are available 24/7 to assist with a wide variety of daily tasks, all of our senior care services are backed with a 100% satisfaction guarantee, and we’ll never ask you to sign a long-term contract. For more information, call one of our knowledgeable Care Managers today at (717) 540-4663.